Which Venus Flytrap should I buy? ➤ B52 DC XL— Obvious ... big traps rule! ➤ Alien — Probably my favorite flytrap right now. Great big traps, weird growth habit and awesome name! ➤ G16 — Consistently large traps on this giant and amazing, deep red coloration to boot! Basically, it's the "perfect" flytrap. ➤ FTS Maroon Monster — Hands down the best red clone I grow; huge traps, excellent vigor, good seeder. ➤ Jaws — Amazing color, shark-like teeth, great vigor and excellent seeder. ➤ Low Giant — Nice low-growth habit with large red traps and a great seeder. ➤ Big Mouth — Absolutely amazing color, nice sized traps, excellent seeder. 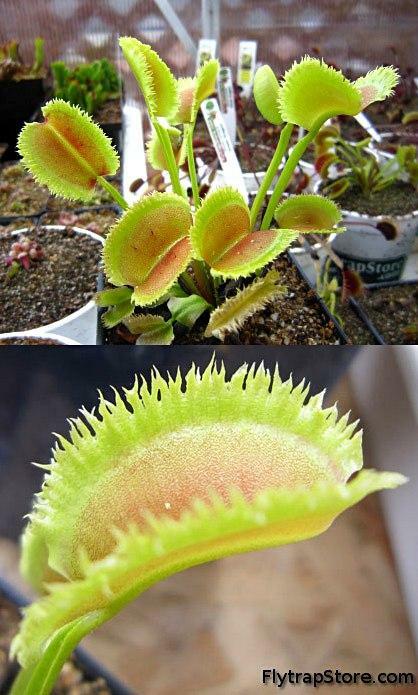 ➤ Wacky Traps — The best freaky looking flytrap out there! Wacky's freaky traps are 100% stable unlike some other freaks. ➤ FTS Crimson Sawtooth — Deep red coloration and awesome looking "teeth". ➤ Fused Tooth — Menacing teeth, great color and perhaps the best seeder of any clone I grow. ➤ Jaws — Awesome unique shark “teeth,” thick-tissued traps, beautiful bright red color, large traps, upright growth, vigorous grower. Real eye-catcher, favorite of many growers for good reason. ➤ FTS Maroon Monster — Huge traps, intense maroon coloring that changes with conditions (can develop forest green highlights), vigorous, hardy- a beautiful large-trapped unique VFT. ➤ Long Red Fingers — Sweeping long crimson eyelash-looking cilia, vigorous, hardy, divides often to form new plants, unique espresso-cup-shaped traps. I tend to photograph this one a lot- that tells you how eye-catching it is. ➤ Korean Melody Shark — Gorgeous delicate musical note-shaped traps, twisty turny vine-like appearance of “stalk.” Looks like something from a magical jungle. Nice salmon and varied other color dusting on traps. Extremely unique. ➤ Plus a few I just couldn't leave off my list! -- FTS Flaming Lips (amazing color), DC XL (huge traps), FTS Lunatic Fringe (fringed cilia like nothing I've ever seen before- LOVE this one).